DVDP has Dolores Claibourne as Suspense/Thriller and Drama. Plus I been told by a couple people they don't consider it horror even though it's a Stephen King movie... so I believe I am safe on that one. this is true... but wouldn't you know... once it arrived it turned up as a different UPC code. When I downloaded the right copy it was listed as horror! Oh well... such is my luck! I don't know what is wrong with me today... just can't get in the mood to watch anything yet today. Not movies or TV Series. Hollywood favorites Ben Stiller (Meet the Parents, The Royal Tenenbaums) and Drew Barrymore (Charlie's Angels: Full Throttle, Never Been Kissed) lead a star-studded cast in this darkly hilarious comedy where one wrong move turns out to be a monumental mistake! Young and vibrant New Yorkers Alex (Stiller) and Nancy (Barrymore) have just found the perfect place to settle down and share a bright future. But their new home comes with a permanent fixture they didn't expect; an obnoxious elderly tenant who won't move out and refuses to die! Pushed to the edge of insanity as their dream home turns into a nightmare, it's only a matter of time before Alex and Nancy begin to entertain some truly sinister solutions to their problem! Also featuring the ever-popular Harvey Fierstein (Death To Smoochy, Independence Day) written by Larry Doyle and directed by Danny DeVito (The War Of The Roses, Throw Momma From The Train), Duplex is another laugh-packed crowd-pleaser you don't want to miss! This is one of the several movies that was given to me lately. Being a big Drew Barrymore fan I was looking forward to seeing it. And she was good in this movie I found it to be just plain fun. I was expecting a little more laugh out loud moments in it... but it was enjoyable all the same. I liked Ben Stiller in this one as well. Which is a good thing as he has been a little hit and miss for me on the ones I have seen. According to Red Sox super-fan Ben Wrightman (Jimmy Fallon), finding romance is about as unlikely as his beloved team winning it all. But when Ben scores a beautiful new girlfriend named Lindsey (Drew Barrymore), suddenly anything is possible. That is, until the baseball season begins, and Lindsey finds herself competing with an entire baseball team - the Boston Red Sox - for her boyfriend's heart and soul. Will Ben's obsession with the Sox put his passion for Lindsey on the bench, or will love win out? And can his team finally break the curse of the Bambino? Hilarious and wildly entertaining, 'Fever Pitch' scores a home run! After the last movie I watched... I felt like watching another comedy with Drew Barrymore. 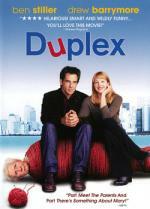 I think I enjoyed Duplex a little more then this one... but it was very close. So close in fact that I need to give it the same rating. Drew Barrymore was adorable as ever in it. I found the story to be very cute and entertaining. Once again there was very few laugh out loud moments... but it was filled with light-hearted fun. I wouldn't count neither American Psycho (another recommendation from me) nor Dolores Claiborne (not bad either). The first may seem as a stalker-killer movie by title but certainly plays out way different and the latter is more of a drama than horror (of the two it would be the one closer to horror, at least a few scenes towards the end are filmed that way). For AP DVD Profiler seems to disagree with me.